Check this "believe" garland out. Double click on the picture to see the detail. I have used the Big Shot, both the snowflake and the serif alphabet, Chunky Essentials glitter, Kiwi DSP, and Crystal Effects. 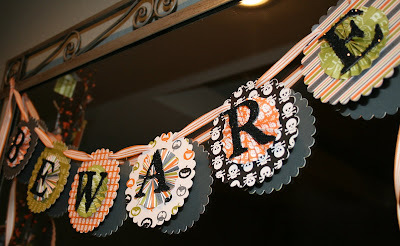 This was one of the three fall/winter garlands from my Halloween Hangings class. Scroll back to see the "beware" garland and come back in a few days to see the "cheers" garland. At my September Technique Time class one of the cards we made included the emerging color technique. The stamp set used for this card is Text and Texture and the Stitched background stamp. I think this look is kind of "urban chic" with the combination of the jumbo eyelet, the arrows, and the fonts of the stamp. 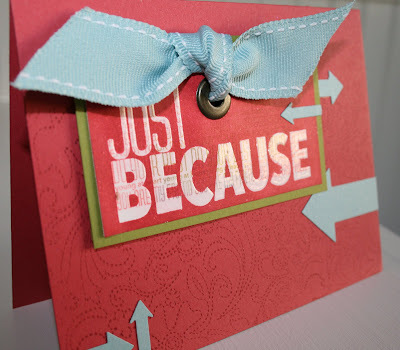 As always as supplies are from Stampin' Up! 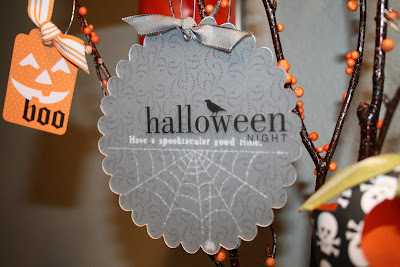 From cool Halloween projects it is now time to start thinking about Christmas crafts. I did purchase the On Board Trinkets Ornaments kit, Ski Slope DSP, and the Big Felt Flurries on a pre-order from the Holiday Mini Catalog. It is super cool as there are so many options. The ideas rolling around in my mind are just waiting to be made. First, I need to finish prepping for my Halloween Hangings class. 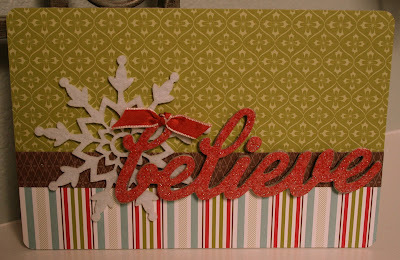 This 5" x 7" "believe" project is the cover for an album. I love making books and this one will be ready for this year's Christmas pictures. 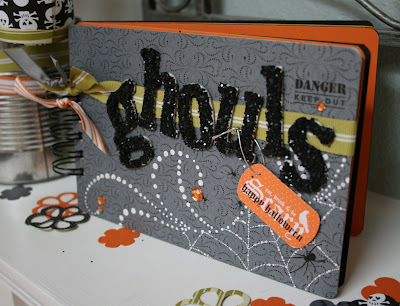 Here is a picture of the Ghouls 5"x 7" scrapbook that we'll be making at my Halloween Hangings class on September 27th. Do you want to join a class or two that day? RSVP by tomorrow. 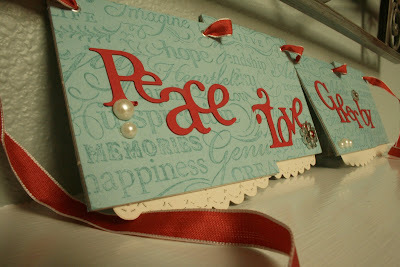 As always all supplies are from Stampin' Up! Here they are two of my Halloween class projects. One is the Chills and Thrills Treat Tree. It is super cool in person. The other project is a "Beware" garland. 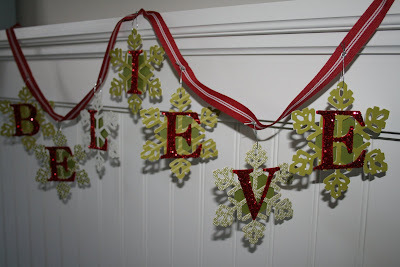 Last year I got hooked on garlands, especially those with glitter. 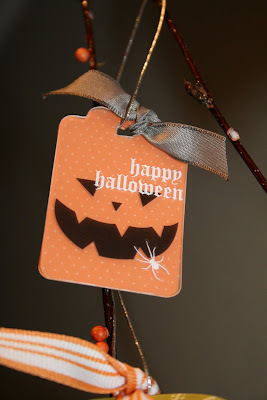 All supplies for these Halloween decor projects come from Stampin' Up! Join the class, or order a kit. RSVP by 9/20/08. 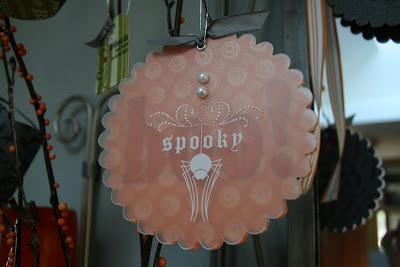 Here are two more close up shots of my "Halloween Hangings" class. Check back tomorrow for a complete reveal of the Chills and Thrills Treat Tree. My class offers three projects and they are super cool. Each kit is available by mail as well as on September 27th. See the right side of my blog for the details. 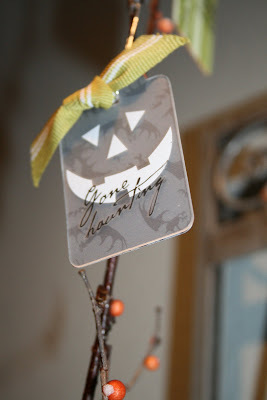 Take another look at just a small portion of my "Halloween Hangings" class. The class is scheduled for September 27th. Crafters can bring their lunch to linger and craft for as long as they desire. What they don't finish they will have photo instructions to complete at home. There are three projects for the day. 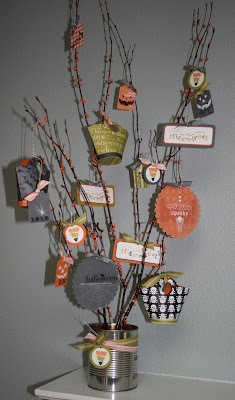 A treat tree, a series of three seasonal garlands, and a Halloween scrapbook 5" x 7" album. Kits will be available by mail as well. Email me for the details--Stay tuned for full photos. 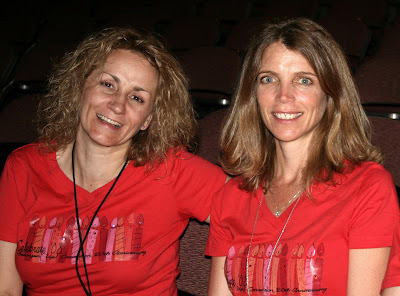 All supplies for the class are from Stampin' Up! and yes chunky glitters are included! My class at the end of the month is called "Halloween Hangings." I have, for a long time, followed Stampin' Up! 's pattern of using alliteration's for titles, so I like to challenge myself to come up with fun ideas. I love this title because it sounds gory and it perfectly matches the projects we'll be making. I have designed a super cool Halloween tree with lots of stamped ornaments and a festive "Beware" garland, everything which gets hung! Here is just a sneak peak--stay tuned for a full reveal of the entire tree and garland. Many of you know that our family spends the month of October at Capistrano Beach. I am getting the "I can't wait to leave" feeling. My mom bought this stamp set, Shellebrate, to make her Christmas cards this year as it is perfect for her style and her love for the beach. We spend the month hanging out on the beach and making lots of projects. Last year I made three garlands, lots of ornaments, and I made a complete 12 x 12 album. The plan this year is Christmas cards, more ornaments and garlands, and handmade beach albums. For this card I used my Top Note die with my Big Shot. This die has been designed exclusively for Stampin' Up! I love it and use it all the time. My last touch to the card was (you guessed) Dazzling Diamonds glitter. In my last post I asked if anyone could guess what I used to create the accent on the side of my card. 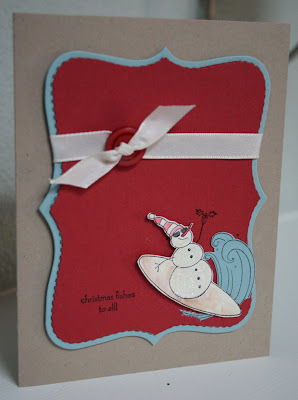 So, here is a look at another card which uses the top flap of the mini scallop envelope. I cut two envelopes with my Big Shot and tucked the top flap under my focal point to reveal the scallop edge. Don't you think it's cool! I do. 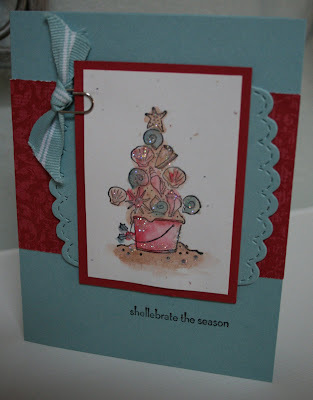 The stamp set I used for the funky sea shell Christmas tree is called Shellebrate. The set actually belongs to my mom. For those of you who don't know I am always using her sets and stuff. 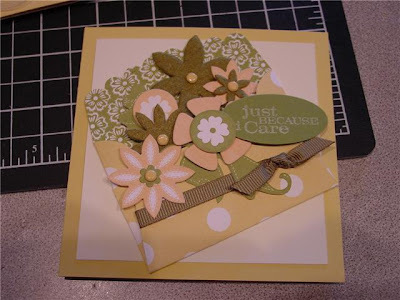 All the supplies to make this card come from Stampin' Up! 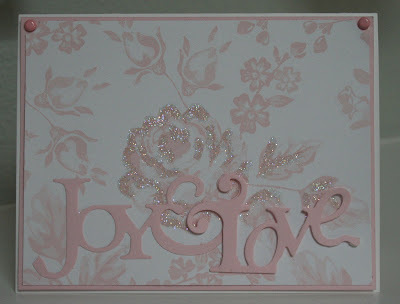 It is always a soothing color combination for me to work with Kraft and the new Pink Pirouette. I hope you enjoy this card. I know it's another Inspired By Nature card, but I made a bajillion of them. 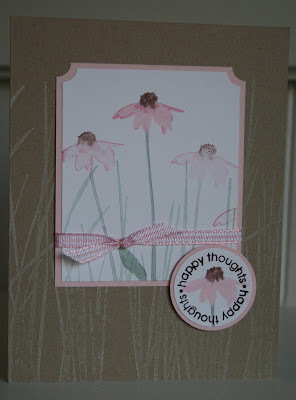 I also used Think Happy Thoughts which is a great set that perfectly fits Stampin' Up! 's circle punches. I won the set at the 2007 Convention in Denver. As always, all supplies come from the Stampin' Up! Idea Book and Catalog. Every year our group stamps matching t-shirts for Convention. This year we went with a color as close to Riding Hood Red as we could get. Speaking of getting t-shirts, Lady Footlocker is a great resource for getting t-shirts in lots of colors and sizes XS to 3X. Instead of stamping directly on the shirts we use iron-on transfer sheets. First we print any sayings on the computer, being sure to print in reverse, then we stamp. For the past two years we have added bling to our shirts. As you know there is no such thing as too much bling.